Making math practice a game makes it a lot more fun for your kids and a lot easier for concepts to sink in. Plus, this activity is Easter-themed! Check out these Easter Egg Spinning Math Facts Pages from 3 Dinosaurs! These pages work on multiplication and division and go from 2-12. There are four math facts per page for your child to fill in, and there is a spinner wheel at the top! You’ll need a plastic spinner, or you can create your own spinner to play this activity. It’s a unique way to get your child to work on their multiplication, division, and recording skills! 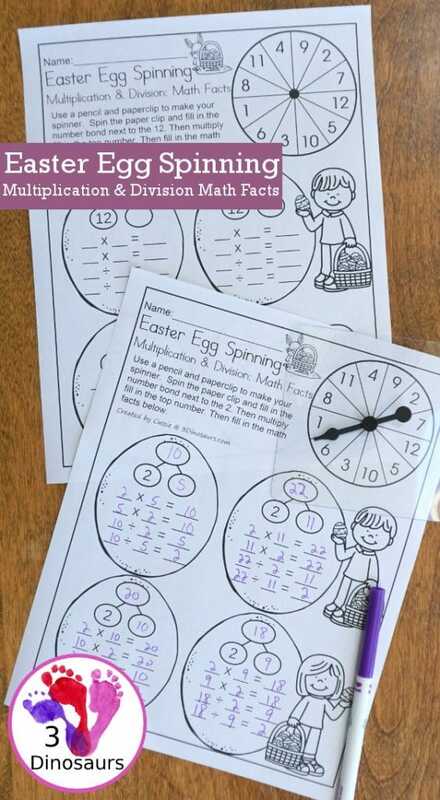 Grab these Easter Egg Spinning Math Facts Pages here!